Peak energy | Growth is Madness! Administrator’s note: Jim Lydecker’s essays have appeared previously on GIM. In this one, which first appeared as a guest commentary in the Napa Valley Register, Jim does an especially good job of tying together succinctly a number of the ecological, economic, and political crises we face. He raises, as well, a troubling question: If our elected leaders are fully aware of the challenges facing us, why are they doing next to nothing to address them? 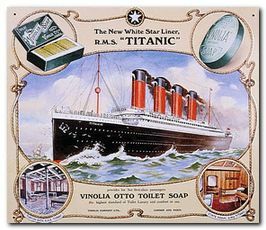 I have written before that America is like the Titanic making her way through an ocean of icebergs. The captain and his staff keep reassuring the passengers everything is OK. Standing on the deck, we see the bergs getting bigger and closer. Looking up at the captain’s quarterdeck, I wonder if they know what the hell they are doing? Can they be so stupid to not see the impending crises in front of us? Are they focused only on those directly in our path hoping to navigate our way through, fingers crossed? Or do they know there is no way out and we are doomed? This allegory is more true than fictional. America faces a convergence of crises of such magnitude that no amount of financial or scientific commitment may be enough to keep them from ending industrial civilization. The future would be less problematic if our leaders had taken on the crises before they became so large and interconnected. Some of us who examine and discuss environmental matters are constantly puzzled and frustrated by the seeming inability of elected officials, environmental organizations, and environmental and political writers to “get” the nature of our ecological plight. Could it be they’re simply unaware of the ecological principles which enable one to understand it? There’s a lengthy discussion on The Oil Drum of Paul Chefurka’s World Energy and Population: Trends to 2100. I mentioned Paul’s paper in the introduction to the previous post here, and recommend it to anyone interested in an excellent, readable analysis of the relationship between peak energy and global population. It goes a long way toward bringing into focus much of the essence of our global ecological crisis. I haven’t read all the comments on The Oil Drum, but there’s clearly enough material there to keep an interested reader busy for days. Good stuff. [10/21/07] Update: See Paul’s newer World Energy to 2050. Given Paul’s reassessment of his WEAP model (see this link, but also Paul’s comments below), a few more words are in order. It seems the key conclusion resulting from over 400 comments on the paper on The Oil Drum was that it did not successfully establish a causal link between energy decline and population decline. That said, I believe the paper has had real value. First, it does contain excellent examinations of some important issues. Second, getting it in front of large numbers of people who could discuss and critique it has moved the discussion of this hugely important topic. We now have some new indication of how difficult it is to demonstrate beyond doubt a link between energy decline and population decline. It remains, of course, a problem of tremendous importance. This is all very speculative, of course, but if true, it may in time help clarify the role of peak energy in the looming convergence of major ecological problems. It could turn out to provide a smidgen more hope for the human future. Unfortunately, with a number of key ecological crises underway, some form of population crash remains a clear concern. See the comments for more. 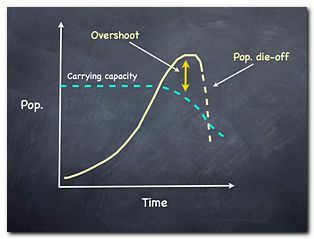 Converging ecological problems include climate change, mass extinction, deforestation, aquifer depletion, soil erosion, depletion of fish stocks, and more, all in the context of increasing population overshoot and consequent decreasing carrying capacity.